For joint support, supporting normal flexibility and a normal inflammation response. Why is it so important to supplement my pet’s diet with Omega 3 fatty acids? Today, our pets are receiving more Omega 6 fatty acids in their diets than necessary. The cattle meat used in most pet foods contains an unnecessary amount of Omega 6 fatty acids because the cattle are now being fed grains instead of grass. Too many Omega 6 fatty acids can cause many problems in your pets. Supplementing our pets’ diets with Omega 3 fatty acids will help to normalize this imbalance. Krill Oil absorbs quickly into the system, providing benefits such as agility, suporint healhty joints and can help maintain a healthy heart, brain and nervous system, skin and coat. Krill oil contains a higher concentration of Omega 3 fatty acids, and also contains Astaxanthin, which is an added antioxident benefit. It does not contain mercury and therefore there is no added risk of heavy metal poisoning. In addition, Krill Oil contains highly bioavailable EPA and DHA which can aid in cognitive function, and support healthy joints. Krill Oil is FOUR times more potent than Fish Oil and therefore has four times the benefit! Because of the Astaxanthin in krill oil; this puts it to the top of the list of all healthy joint support products. Krill oil contains omega-3 fatty acids and DHA, which is the main reason it's a popular joint support antioxidant supplement. Unlike fish oil, krill oil doesn't cause fishy breath. Also, krill oil contains higher amounts of astaxanthin than fish oil. a hundred times more than salmon oil! down and pump until primed, then pump upright normally. Side Effects; Pets with allergies to seafood shouldn't use krill oil. Tri-Krill™ contains high levels of one of the most powerful natural antioxidants called Astaxanthin. Astaxanthin is a carotenoid molecule from the same family as beta-carotene, lycopene, and zeaxanthin, though astaxanthin appears to be more active in quenching superoxide, hydroxyl, and other radical species. Recent studies suggest that astaxanthin is good for joint support, supporting normal flexibility and a normal inflammation response, inhibiting cytokine cascades in a number of trials of cardiovascular health, respiratory health, joint health, athletic performance, and others. These small crustaceans fuel the oceans of the world. Krill feed on phytoplankton, microscopic, single-celled plants that drift near the ocean’s surface and live off carbon dioxide and the sun’s rays. They feed hundreds of animals from fish, birds and whales. Antarctic krill are among the largest of the 85 known krill speciesand can live up to 10 years. Krill oil contains omega-3 fatty acids, which is the main reason it's a popular healthy joint support supplement. Unlike fish oil, krill oil doesn't cause fishy burps or an after taste. Also, krill oil contains higher amounts of astaxanthin than fish oil. Over 100 times more than salmon oil. Give one measured pump for every 10 pounds of your pet’s body weight every day. This may be doubled for added support or on the advice of your veterinarian. Pets with allergies to seafood shouldn't use krill oil. Tri- KRILL ™ oil contains no less than 42% Phospholipids and 20 X the Astaxanthin, higher than any regular krill oil product on the market. Every batch is tested for contaminants and heavy metals. We feel we have set the highest standards for quality in our krill oil. It is also independently tested with 3rd party testing. Our krill is made from Euphausia superb (Antarctic Krill). This is one of the earth's most abundant and sustainable organisms. Antarctic krill is the largest biomass on earth. The total quantity is estimated to be between 500 and 800 million tons. The weight of this biomass is almost double that of all the humans on earth. The krill harvest is well below conservative international catch guidelines. Most of the harvested krill is used for fish feed in salmon farms and the quantities harvested are less than 1% of the 1% harvested annually. While krill contain natural levels of astaxanthin, we enrich our Tri- KRILL ™ with additional astaxanthin to 7 times the regular level. This is in recognition of the tremendous antioxidant value astaxanthin adds to both product stability and clinical outcomes. Can pets take Krill Oil if they are allergic to shellfish? It is not recomended. Talk with your veterinarian if you suspect your pet is allergic to shellfish or fish. Some krill oil blends also contain some fish oil as a carrier, and fish can end up in the krill biomass as a by-catch. So, if your pet is allergic to fish do not give him/her this product. Why is it so important to supplement my pet’s diet with Tri-Krill? Today, our pets are receiving more Omega 6 fatty acids in their diets than necessary. The cattle meat used in most pet foods contains an unnecessary amount of Omega 6 fatty acids because the cattle are now being fed grains instead of grass. Too many Omega 6 fatty acids can cause many problems in our pets. Supplementing our pets’ diets with Tri-Krill will help to normalize this imbalance. Krill Oil absorbs quickly into the system, providing benefits such as agility and can help maintain a healthy heart, brain and nervous system. 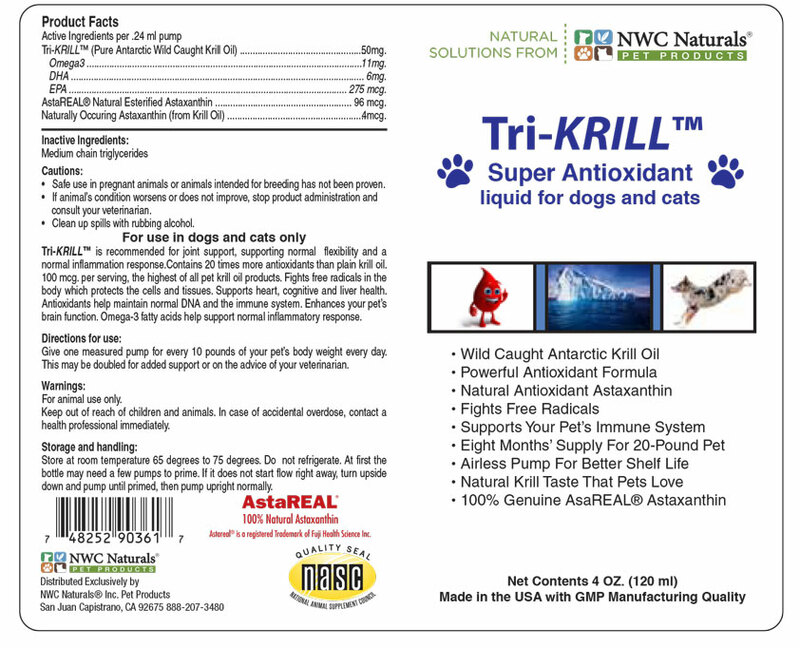 Ask your veterinarian about how Krill Oil can benefit your pet! Isn’t fish oil a good source of Omega 3 fatty acids too? Yes. However, Krill oil contains a higher concentration of antioxidants, containing Astaxanthin, which give an added anti-inflamatory support for healthy joints. It does not contain mercury and therefore there is no added risk of heavy metal poisoning. In addition, Krill Oil contains highly bioavailable EPA and DHA which can aid in your pets health. Krill Oil is FOUR times more potent than Fish Oil and therefore has four times the benefit!